December 10, 2010: The second printing with corrections of Document Preparation, both color and b&w paperbacks, is now available on Amazon.com as well as in the CreateSpace eStore. The downloadable PDF version has also been updated. 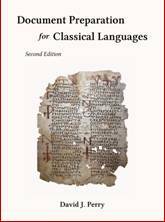 If you want to learn about Unicode, smart font technology, choosing and using fonts, or tools for editors; or if you are a scholar in Classics, Biblical Studies, Medieval Studies, Linguistics, or related fields, this book will be of interest. If you have purchased the book, this page will also provide updates as they become available. To see information about the book, including the Table of Contents and sample pages, click here. To order the book, click this link. To check for errata and updates, go to this page. If you have a question or comment about the book (something that was unclear or that you would like more information about, e.g.) email me and I may respond on this page and/or in the next edition of the book. Click here for current email address. Click here to return to the main Fonts for Scholars page. Last update December 10, 2010.